First Line: The crowded red double-decker bus inched its way through the snarl of traffic in Aldgate. Rick Braithwaite, World War II Royal Air Force pilot and Cambridge-educated engineer, finds himself accepting a teaching position in London's East End. His pupils are angry, unmotivated, bigoted white teenagers who've been mostly abandoned by the system. When his efforts to teach them are met with derision and suspicion, he takes a whole new approach that will lead to one very remarkable school year for teacher and pupils alike. I must be on a sentimental journey involving some of my favorite films and the books they were based on. 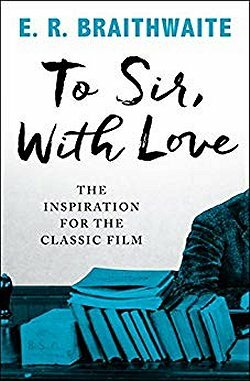 First, it was The Shrinking Man, and now it's To Sir, With Love. This time, the book compares very favorably to the movie. In the book, we see everything through the eyes of "Sir" instead of being an outsider-looking-in as we are in the movie. There are several things that were either glossed over or not even brought up in the movie-- in many cases I think the filmmakers wanted the audience to use common sense to realize, for instance, that the reason why Braithwaite could not get an engineering position was due to racism, not the fact that there were no jobs available. In fact, almost everything relating to racism was left out of the movie, no doubt in an effort to make it palatable to the greatest number of moviegoers. My final verdict? I still love the movie starring Sidney Poitier; I always will. But I am very glad that I read E.R. Braithwaite's autobiography. In reading the book I feel as though I've gotten much closer to learning the entire story while the movie gives me the Reader's Digest condensed version. That sounds fantastic and a revelation about the real story behind the film. It's too bad that the racism was left out. Both the British and U.S. audiences needs to see the truth. But I'll add it to the TBR list and hope I read it this year. And, yes, all due respect to Sidney Poitier in this movie and all others. He was subjected himself to horrid racism in this country which he talks about in his memoir. He broke a lot of barriers and is a terrific actor and person. Bottom line, they wanted the movie to sell plenty of tickets and make them money, and other than that omission, the movie screenplay is faithful to the book. Sidney Poitier? I've always loved that man. What a wonderful talent and incredible human being. His memoir is quite something.